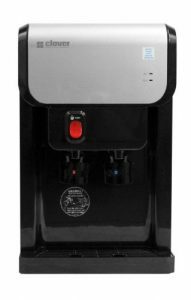 Clover D1-K is a high-end countertop style hot and cold bottle-less water cooler with a modern compact design and a rugged and durable construction. It runs efficiently and without dramas at all times and the taste of water will be clean and pure. You will not need to purchase any 3 to 5-gallon water bottles and there won’t be any lifting and top or bottom loading issues. This will save you quite a bit of money over time as you will be getting the water from your plumbing system. There will be no delays or pauses of when you run out of water or when you need to change the bottles. You have two convenient and easy to use push faucets for cold and hot water, as well as a Hot Water Guard. It runs quickly with the ability to fill 16 ounces of water in less than 8 seconds. And despite being more compact in size than the standard bottom and top loading bottle type water coolers, it has a deeper fill area and you can fill your containers and sports bottles easily. Clover D1-K is only 17.2 inches tall and will fit and can be installed under most regular cabinets. You have the encased metal exterior with the heavy-duty hardware inside, so it is very sturdy and will last quite a while. It is simple to clean and does not need much maintenance work from you. It has two 304 electro-polished stainless steel cold and hot water reservoirs along with the heating coils and copper refrigerant lines so there is no bad taste. 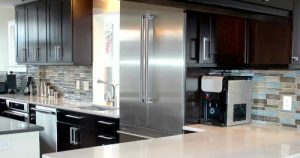 The Dual Float with Emergency Shut-off feature ensures there will be no water leaking. As an important security measure, it includes a patented child safety hot water protection so your small kids do not burn themselves by accident. It is quite easy to install at home or in the office with the installation hardware, Everpure 2H-L filter cartridge and water line included. The black and silver Clover D1-K is made of ABS plastic and pre-coated metal weighs 26 pounds and measures 10.7 x 16.8 x 17.2 inches. It has a R134a type efficient LG compressor, the cold water rate is 0.6 gallons per hour at 50 degrees Fahrenheit and the hot water rate is 1.8 GPH at 185 degrees Fahrenheit. Hot water temp is not adjustable but cold water is, between 32 and 50 degrees. It comes with an integrated filtration system with a 12 months or 750 gallons filter life. It is a UL listed and Energy Star rated product. Cold water is very cold and hot water is hot enough to make hot coffee, tea, instant soup, noodles, oatmeal or hot water for cooking. It looks and feels premium, has a sturdy construction, is very easy to set up, works well and is worth the money. Warranty offered is three years for the compressor and one year for the parts, along with good customer support.